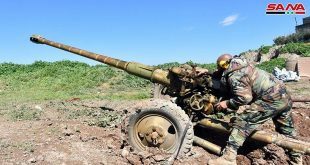 Provinces, SANA- The Syrian army and armed forces continued combating the terrorist organizations Tuesday killing a number of their members and destroying their dens, positions and hotbeds in other areas. 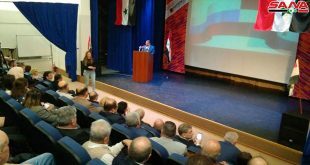 A military source told SANA that a Syrian Arab Army unit established control over Agricultural Arboretum hill, the quarries, and a number of buildings in their surroundings in Harasta in Damascus Countryside. The army continued operations against terrorists and managed to kill scores of them in al-Samadi- the last of terrorists’ hotbed in the area. An army unit killed all members of a terrorist group to the east of Zanobia School in Daraa al-Mahatta neighborhood in Daraa province and destroyed their weapons and ammunition. 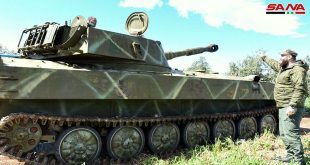 In the northeastern countryside of Daraa province, army units destroyed a vehicle equipped with heavy machinegun and killed a number of Jabhat al-Nusra terrorists to the northwest of al-Ghariyat bridge near kherbet Ghazaleh village. An army unit destroyed hideouts and positions for Jabhat al-Nusra and other terrorist organizations in Ataman town, on the northern entrance of Daraa city. Meanwhile, a source in the province asserted to SANA reporter that terrorists positioned in Samlin town fired 19 mortar shells on the citizen’s houses in the northwestern side of al-Sanamin city, leaving material damage in the public and special properties. A unit of the army and armed forces carried out a special operation against a position of the ISIS terrorists near Maheen town in the southeastern countryside of the central Homs province, a military source told SANA on Tuesday. The source added that more than 25 of ISIS terrorists were killed and 6 of their machinegun-equipped vehicles were destroyed, in addition to amounts of arms and ammunition that were in their possession. Meanwhile, the Syrian army air force destroyed fortifications and hotbeds of ISIS terrorists in al-Qaryatain city, Maheen town and the villages of al-Hadath and al-Hafr in the province countryside. The army air force targeted ISIS hideouts in a number of areas in Palmyra and al-Hazm al-Awsat, killing scores of terrorists and destroying their weaponry and munitions. An army unit targeted terrorists’ hideouts in Talbeseh, al-Shawmaryeh al-Qneitrat and al-Mishrfi, north of Homs city, and killed and injured a number of terrorists. Syrian Army Air Force continued directing strikes against gatherings and dens of terrorists from the so-called Jaish al-Fateh in the northern countryside of Hama. The air strikes by Syrian Air force destroyed dens and fortifications of Takfiri terrorist organizations under the leadership of the so-called Jaish al-Fateh in Latmeen and al-Saiyad villages in Kafar Zeta area in the northern countryside of Hama. A number of terrorists were killed, others were injured and their vehicles which were equipped with machine guns were destroyed during the air strikes. The army also targeted terrorists’ concentrations near Athrya and in Salba in Hama’s eastern countryside, killing and injuring scores of terrorists and destroying a number of their machinegun-equipped vehciles. intensive operation against dens and gatherings of ISIS terrorists and other terrorist organizations in Aleppo province. A number of terrorists were killed during the air Strikes and their vehicles equipped with machine guns, arms and ammunition were destroyed. Army units inflicted heavy losses in personnel and munitions upon Jabhat al-Nusra terrorists and other terrorist organizations during concentrated operations against their dens and gatherings in Al- Haded and al-Zurbeh towns in the southern countryside of Aleppo. Meanwhile, Takfiri terrorist organizations acknowledged on their social media pages that 42 terrorists of their members were killed including four self claimed leaders during army operations in the southern countryside of Aleppo. 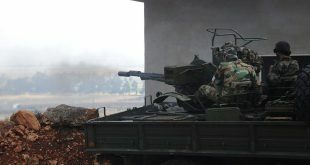 In the western and northern countryside of Aleppo, A number of terrorists were killed, others injured and their vehicles some of which equipped with machine guns were destroyed during concentrated strikes by army units against their dens and supply routs in villages and town of Shamer, al-Amarah, Hreitan, the surroundings of Handarat, Kafar Dael and al-Mansourah. Another army unit eliminated hotbeds of Jabhat al-Nusra terrorists and other terrorist organizations in Bani Zeid neighborhood in Aleppo city. Meanwhile, terrorist organizations acknowledged on their social media pages on Tuesday the killing of 42 terrorists, among them 4 self-claimed leaders in army units’ operations in the southern countryside of Aleppo province. The terrorist organizations pointed out the killing of the so-called military leader on Ahrar al-Sham Movement nicknamed Abu Ali al-Noua’imi,a leader in Omar al-Farouq brigade, affiliated to the Movement, nicknamed Oqba Abu Ahmad, the military leader of Aleppo brigade Saleh Sandeh, and field leader of al-Jabha al-Shamiyeh nicknamed Abdullah al- Ramleh. The terrorist organizations also posted the names of a number of their dead terrorists in addition to the names of 25 leaders and members of the so-called Jaish al-Islam terrorist organization. The Syrian Arab Army’s Air Force launched airstrikes against ISIS sites in al-Jafra and al-Mrieiha in the southeast countryside of Deir Ezzor province, a military source told SANA. 29 terrorists were killed by the airstrikes in Hwijit al-Mrieiha, and 9 terrorists were killed in al-Jafra, while one ISIS site and a vehicle equipped with a heavy machinegun were destroyed. Sources on the ground told SANA that an army unit destroyed a communication center belonging to ISIS in al-Hissan village in Deir Ezzor, killing all terrorists inside it and destroying 7 pickup trucks equipped with heavy machineguns. The sources added that an army unit destroyed a workshop which terrorists were using for manufacturing explosive devices in Hatla town in the eastern countryside of the province, killing many of terrorists in the process. According to the same sources, army unit confronted an attempt by ISIS terrorists to infiltrate safe neighborhoods in Deir Ezzor city, killing many of the attacking terrorists.